I don't know about you, but I did not miss the sound of my alarm going off this morning. Instead, I slept in....and it felt wonderful! I have a busy day planned, but the great thing is I didn't have to start it at 5:00 am like I did last week. Yay! Don't get me wrong...I LOVE my job and I LOVE spending all day with my adorable first graders, but there's just the tiniest part of me that doesn't like getting up so early. I can be a morning person when I have to be, but I am definitely by nature a night person. I can stay up forever during the summer! Today, I have to clean my very neglected house. I spent all last week cleaning, organizing, and rearranging my classroom until late at night some nights. But, I didn't do any cleaning at home and it is screaming at me this morning. This is what my living room floor looks like in the corner because I was working on a project for my master's course over the weekend. It's demanding to be picked up this morning. 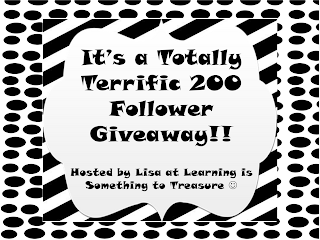 Before I go though, I have to share about my bloggy friend Lisa's 200 follower giveaway! Hi! Love your blog. I am your newest follower. I would love to have you visit mine.